It's been all Paint, Wax and Polish here, so some finished items. Victorian Chairs, lovely for your bedroom. These were painted to match the fabric. Emperor's Silk with Greek Blue Underneath. Distressed a bit so the blue shows through. Now I had some old vases and pots that had been hanging around in the boot fair box for years. I wanted to try some new techniques with my Annie Sloan Chalk Paint so they have all had a makeover. The beauty is if I don't like them I can paint over again. I mixed colours, decoupaged with napkins, added some gold leaf, did a bit of free hand painting, an image transfer and then waxed and polished. I like this last one best. Which is your favourite? A very Shabby Chic Tea Trolley, this was a really treacly dark brown. Pretty wallpaper, a sample from The Range. Craquleure glaze makes the paper look really old. Saturday I went to the Auctions with my friend Jane. I could not resist this lot of toys. Below is just a sample. A very rare wooden toy from Abbatt Toys, the V&A has some of their items in the Toy Collection and so does the Museum of Childhood. This is 1960's era. It's really interesting to research these toys, the married couple of Paul and Margaret Abbatt were at the forefront of to design from the 1930's to the 1970's. A whole wooden town, with people and animals. Again 1960's, but still similar made today. Made in Finland early version of the sorting box toy again 1960's. And finally a whole army of Britains Farm Animals. 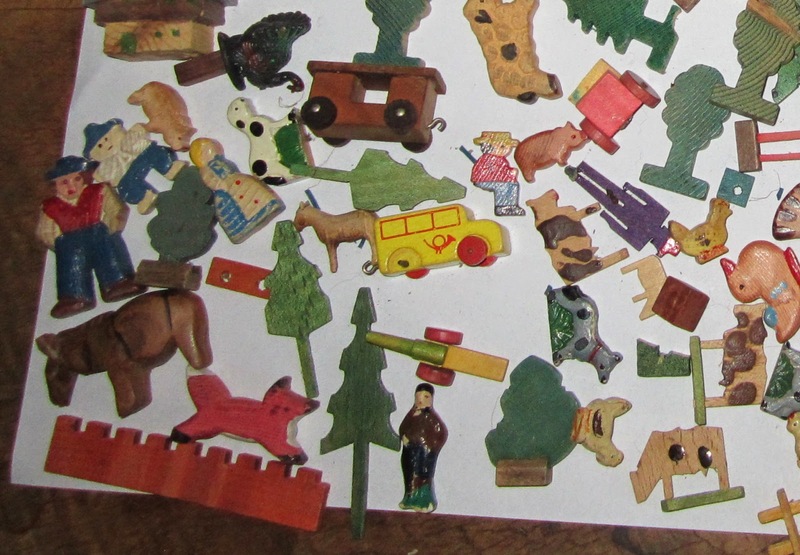 There were also Zoo animals, tractors, trucks, tray jigsaw puzzles, wooden pull along toys, music toys and two books. All off to Ebay but it's been fun remembering playing with my children with toys like these. I think one or two may be sneaked off to my young grandson! Now let's see what all you folks have been up to on Handmade Harbour. i love love love the tea trolly! you have been busy! look at all you have accomplished. and all beautifully done. ps: the small farm toy animals are terrific! What a great week and a great post - lots of lovely things to read about. I particularly like the vase you have decoupaged with a napkin, very pretty. Hope you have a good week. I love the chairsand the tea trolley too. It's hard to decide which piece is my favourite though. You have been busy with your makeovers, well done in a good job. Bit jealous of your auction finds! Favourite is the jug, I seem to have a thing for jugs.